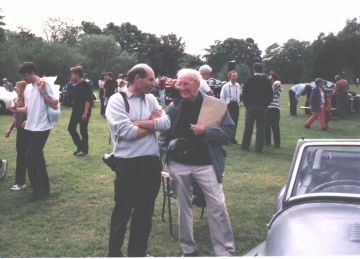 At the JCC rally May 24th 1998 Ed Nankivell met a number of former employees, who had been apprenticed at Jowett in the fifties and who had worked on the Jupiter. They recalled making component parts for Jupiter such as the grilles, the windscreen, seat frames, and numerous other components they pointed out to me. These piece-parts started life as sheet steel or sheet brass, etc, requisitioned from Stores. The sheets were guillotined to size, nibbled to shape, and then formed by hand over wood or steel formers or jigs. In fact, the Jowett Jupiter Sports Car was built entirely by hand by skilled craftsmen. JCC Rally, May 24th 1998. Two of the 20 or so Jupiters and 60 or more other Jowetts: a couple of Bradfords can be seen in the background. Proud Jupiter owners the world over cannot resist leaving their car's bonnet lifted. Some, indeed many, of the Jupiter's components, even quite humble ones like the water pump spindle rear support, required such a high degree of skill to make that it looks as if the Jupiter was seen as a training device for tinsmiths and sheeties. The tubular chassis began life as lengths of tubing and some sheet steel. The tubes were cut to the 40 or so pieces required, the ends shaped. The 40 or so sheet steel components were cut, shaped and drilled. Astonishingly every individual piece had a part number and a name! The chassis was progressively welded up on a rotatable jig until finished. It then went to Inspection, then to the bonderising and stove-enamelling shops, before joining a heap of frames outside in the open, waiting until needed by Production. In this picture, taken at the JCC rally as above, Peter Holden (with camera) talks to Harry "Digger" Metcalf (with buff envelope). Peter is the JCC Spares officer. Digger was an apprentice at Jowett in the early fifties, and made Jupiter components. To the right, wearing braces, is Dennis Sparrow, who runs a Jowett workshop in London. Skilled panel-beaters worked tirelessly with rolling machine and mallet to form the body panels, which then needed to be invisibly welded into larger panels. Truly the Jupiter was totally hand-made at Bradford, just like the pre-war vehicles. The Javelin and Bradford, by contrast, were bought in as complete bodies already trimmed and painted (from Briggs Bodies), and just the mechanicals were added. 56 5 Jan 51 First Jupiter with full hydraulic brakes and larger braking friction area. 165 approx June 51 Louvres added to bonnet for improved cooling whilst car is stationary. 439 approx Oct/Nov 51 Petrol pump (suction type) relocated from firewall near engine to midships on chassis (pressure type) to overcome vapour lock. 504 approx Dec 51 Shorter oil filler pipe. For some cars, this component fouled the centre grille. 940 Oct 52 Mk 1a available with externally opening boot, 8 gallon fuel tank (it is 11 gallons on the Mk1) and symmetrical metal instrument panel and door tops (wood on the Mk1). Tubular crossbracing to support the door hinges introduced. The Mk 1 continued to available for a time, some with the cross-bracing and metal door tops. 935 23 June 53 Last Mk 1 Jupiter delivered. 1033 4 Nov 54 Last Mk1a Jupiter delivered. Note: Gaps in early Jupiter chassis numbering (chassis 6 - 16, 22 - 40 etc in column 1 above) were rolling chassis shipped to coachbuilders to construct there own bespoke bodies. 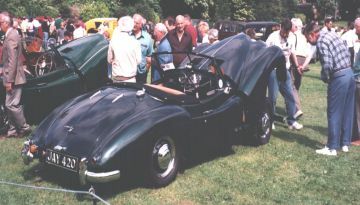 Later gaps in chassis numbering represent genuine gaps, hence the total build was not 1033 Jupiters of all types, as the chassis number of the last Jupiter suggests, but 825 standard Jupiters and 75 rolling chassis. Moreover, chassis 2 was the factory exhibition chassis, and it was built into the last Jupiter: chassis 1033. This gives us a total factory build of 899 possible Jupiters including special bodies. To this one could add the three R1 sports racing Jupiters and the three R4 Jupiters. Another standard Jupiter was built from spares in te mid 1950s and the Rochdale special-bodied Jupiter was also built with glass fibre bodywork but otherwise standard.